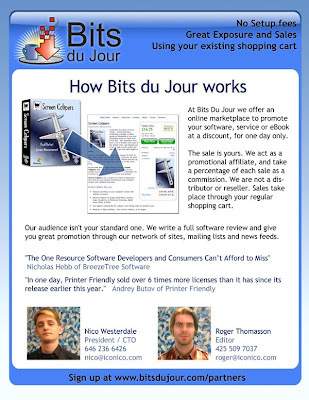 At BitsDuJour.com we promote software written by a wide variety of developers. We run a 24 hour discount on the software and some developers see a huge uptick in their sales for the day, but some don't, so why do some promotions work, and others don't? The first answer is down to the software, great software sells, and poor software doesn't, but you can help your chances. We've seen that a discount of 40% or more creates a change of perception in the mind of the customer, moving the promotion from "interesting" to "must have". Given that we run the deal for only one day the large discounts really help to push the sales through in a short time. We get asked time and time again by software vendors running promotions with us about the best way to help promote a one-day software deal. The answer I always give is that the first and best place to promote is with your existing customers. The fact of the matter is that if you send out an email to your existing customers saying you have a one-day sale with us, and ask your existing customers to tell their friends and families you will get more sales. In some cases much more. Existing customers have already made the decision to purchase your software, and if you ask them then more often than not they will be keen to pass on the good news about a product that they already like. However, there is often a little hesitation in doing this. 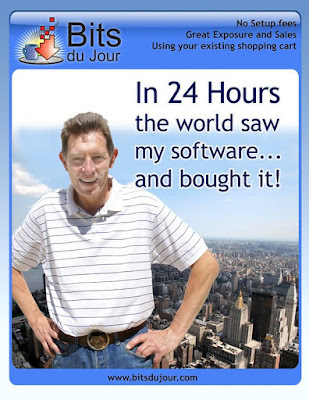 The savvy developer thinks "Hey, I could do this all myself, and I wouldn't have to pay a percentage of the sales to BitsDuJour". Yes, you could set everything up to run the promotion and mail them. However the fact of the matter is that setting this up will take a significant amount of time on your part, and we have all the tools you need to run a successful promotion for you, RSS, notification emails, a professional write-up and layout, so either you pay in your time, or you pay in your percentage of the sales. so yes we're getting a cut, but a cut of sales that would have never existed. One last point. We have offered for some time now a way to place all our daily deals on your website, totally seamlessly branded with your pages. If your store generates a sale we give you 50% of the commission. So if you set up a store, and promote your product directing people to your store you'll get back half of the commission that you pay to us, which is typically 30%. So basically that's only 15% that you pay to us *after* the discount and any e-commerce fees are applied. Put another way, if your product usually costs $30 and you ran a 50% off promotion you'd pay us a little over $2 per sale for all the professional features and tools that you need to run a daily deal promotion. I hope that's finally a strong enough argument for why you should promote to your mailing list as well. Again thanks to all of you who have promoted with us.